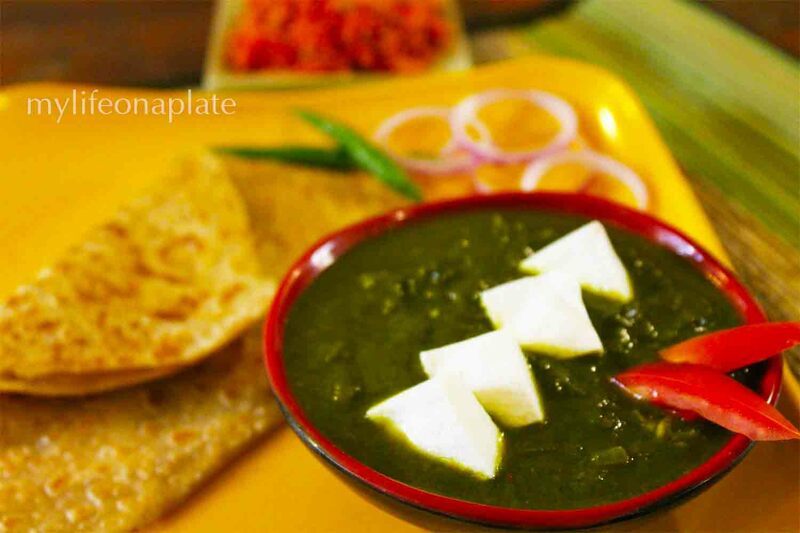 Palak Paneer is a commonly made, and favored dish in the North of India, especially Punjab. 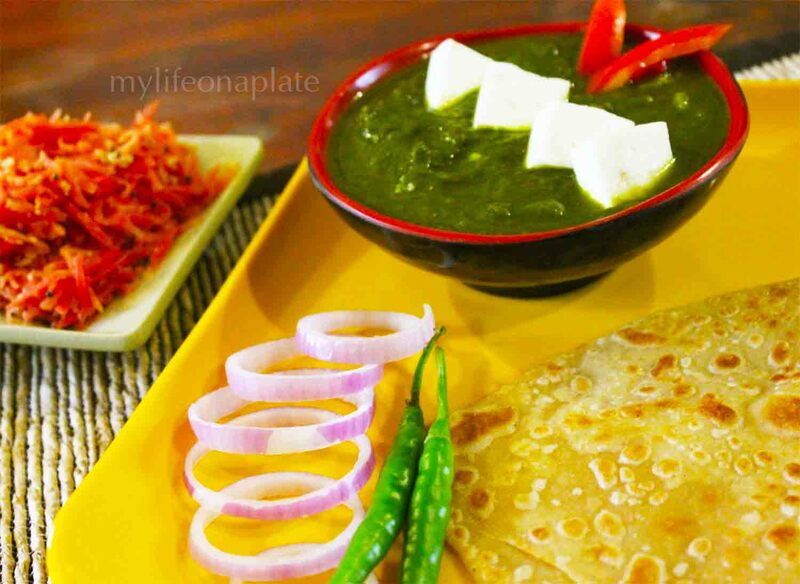 The thick, rich palak gravy, with succulent pieces of soft paneer…dipped in hot, flaky butter paranthas…is the stuff gastronomic dreams are made of! 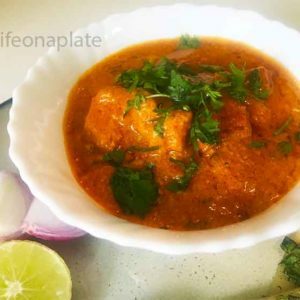 Even though it is mainly a Punjabi recipe, it is now found on the menus of almost all restaurants in all parts of India, right from Maharashtra to the South. As Palak Paneer is a veritable powerhouse of good proteins and minerals, plus fibre, it has quickly gained popularity as the vegetarians choice of saag. 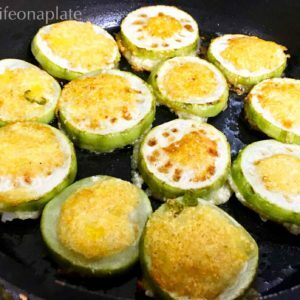 There are lots of different ways you can make this… posted here is a quick and easy recipe. In a kadhai, heat oil, add the jeera, hing, ginger, garlic, green chillies, onions and saute till the onions turn transparent. Clean, cut and wash the spinach leaves thoroughly. Add these to the kadhai and saute. Cover for 5-7 minutes. The leaves will be partially cooked by now. Switch off gas. Take care not to overcook the leaves, as they will lose their lovely, green colour otherwise. Cool and blend to a thick paste in a mixie. Again take oil in a pan, add the palak puree, the red chilli powder, garam masala powder and the kitchen king masala. Mix in salt as required. Cover for 5 minutes. Your palak gravy is ready. Now add the paneer cubes and malai. Give a final stir and switch off gas. I make paneer at home and it turns out just as creamy and soft, even better than the store-bought one. Heat milk. Once it comes to a boil, add 1tsp. of white vinegar. Stir till the milk curdles. Pass through a fine sieve to drain out all the water. Tie it in a thin muslin cloth and tap into a square shape. Keep under a weight for around half an hour. After that transfer it to the fridge for around 1-2 hours, to be used whenever you want creamy and soft paneer! 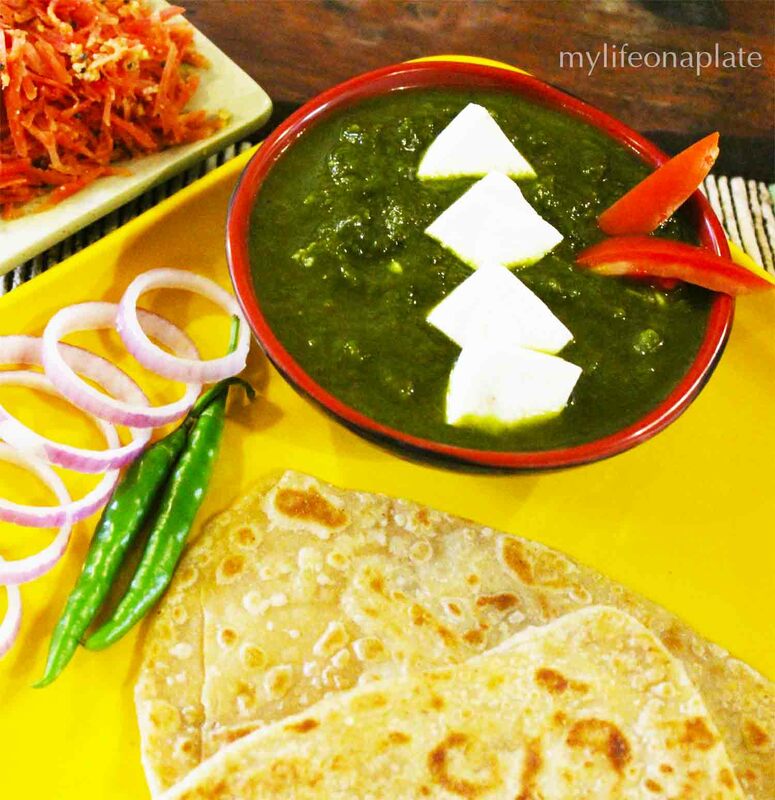 Serve the hot palak paneer with paranthas, naan or rotis. Butter adds more flavour to the paranthas.